We all know how effective a short, concise landing page can be. It’s quick to read and, depending on the offer up for grabs, can convince visitors to purchase or opt-in fast. But there are benefits to building long-form pages too. For starters, longer pages can provide in-depth info visitors need to make informed decisions, helping you attract more qualified leads from the start. Moreover, your company may have offers better suited to a longer page with more convincing to do. According to our Conversion Benchmark Report, which analyzed the behavior of more than 74 million lead-gen landing page visitors, pages with 125 words or less typically had a 15% higher conversion rate (I mean, concise converts!) But for pages between 250 and 750 words, we found conversion rates really only varied slightly in this range. persuading customers to invest in especially expensive software, services, or high-commitment offers. Page length is less about preference, and has more to do with the complexity of the offer at hand and the stage of the buying process someone’s in. You need to cover all your bases, anticipate objections, and show that your offer is legit. A heckuva task for a limited amount of copy. So, to inspire your next not-so-short page, we analyzed five long-form landing page examples below. Here’s our take on why each of these built-in-Unbounce pages work so well. Why this works: No questions are left unanswered. 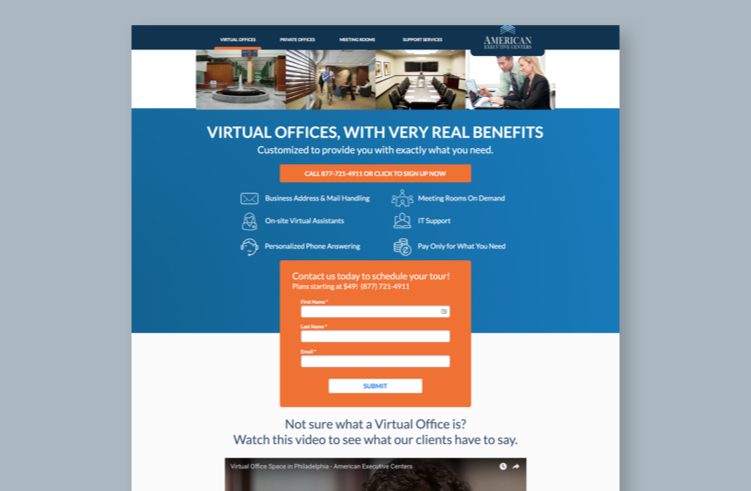 This long-form landing page immediately highlights American Executive Centers’ distinct offering in the headline, and above the fold (i.e. they’re offering virtual office services like mail handling, virtual assistants, and meeting rooms). Given the decision potential customers face here, it’s important that the brand’s presented a bulleted, quick-to-read list of what’s up for grabs at the beginning of the page. By listing all the key features above the fold like this—readers can quickly get a sense of whether AEC will meet their core requirements. This is especially important for busy decision makers who are comparing their options. If AEC’s landing page is just one of many someone has open in their browser, for instance, it makes a strong case against competing pages where core offerings may be harder to spot. The landing page doesn’t stop there, either. 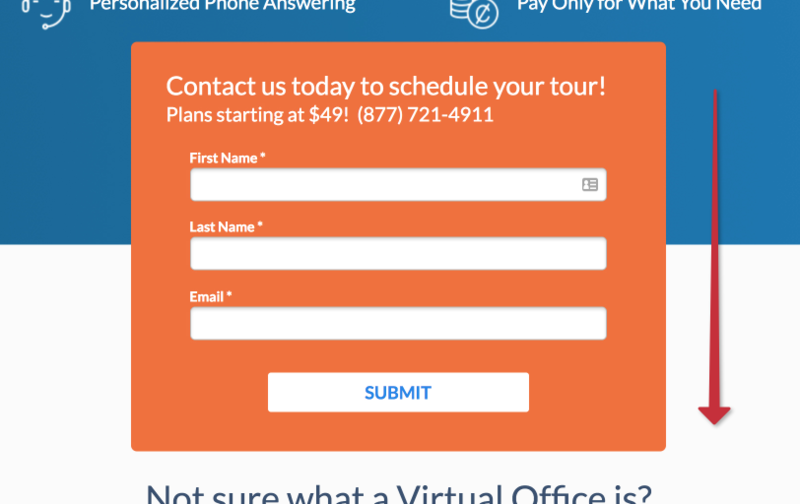 Their contact form appears above the fold in an orange rectangle that bridges between the two sections. This contrast encourages the eye to move down the page. Below the fold, AEC shares detailed information about where they operate and emphasizes the benefits over the competition. They also list packages and pricing so customers can independently decide whether the service fits their budget. The lesson here? Extra copy may not be required to convert a consumer on a personal purchase, but when their decision impacts an entire team or workplace, it clearly helps. For a B2B company like American Executive Centers, using a long-form landing page makes sense because it allows this brand to cater to a more intense consideration phase in the buyer’s journey. Why this works: Simple, straightforward design—and an incentive for customers. 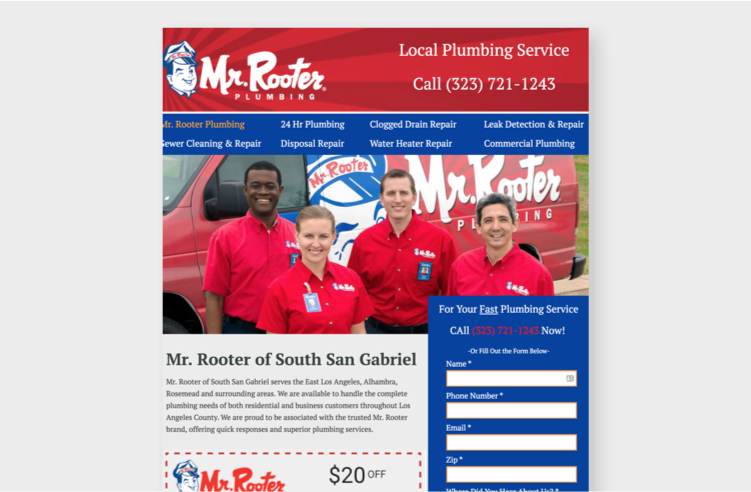 Mr. Rooter’s landing page (developed to promote their South San Gabriel service region) is not necessarily long in terms of the number of page sections, but it’s got a lot of copy and details. Right off the bat, readers can see what Mr. Rooter offers. Adding a phone number to the header also gives customers who are urgently seeking a plumber an immediate point of contact. Hey—when the water’s gathering around your ankles, you don’t have time to read an entire landing page. Additionally, all of the cities within the South San Gabriel region are listed—so customers don’t have to do further research. And people like a deal. By offering a $20 discount, the page gives customers an extra incentive to use Mr. Rooter over a competitor. The placement of the offer is on the left-hand side of the page, which is ideal considering that online readers’ tend to scan pages from left to right in a Z- or F-shaped pattern. The offer is also an example of basic but effective skeuomorphism, with a dotted line that immediately calls to mind coupons in printed media. The page goes on to describe the company’s areas of expertise in detail—something condensed landing pages don’t offer—and highlights why customers choose Mr. Rooter by including some benefits of their service (24/7 availability, reliable specialists, local area knowledge) as well as testimonials. 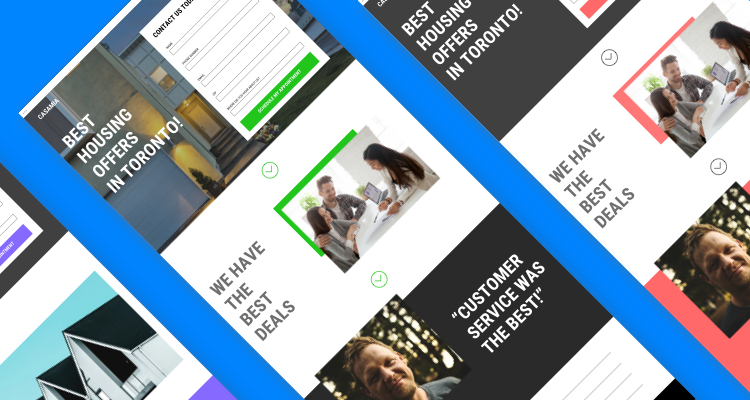 This example proves that in many industries, substance matters more than stunning design—and you don’t need a technical background to build a landing page that does the trick (shameless plug: especially not with our landing page templates). Why this works: Expert insight and in-depth product details. We’re startin’ to see some patterns here. 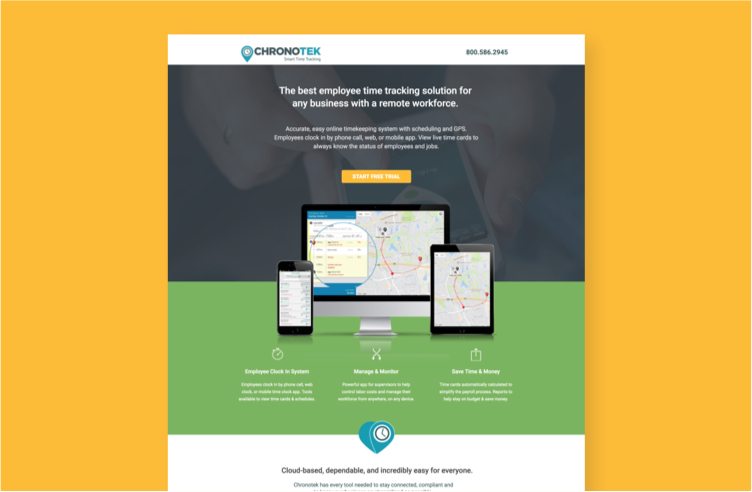 Just like the above long-form landing page examples, Chronotek showcases its primary features above the fold—along with a direct heading that describes their product in clear, uncomplicated terms. Having both these elements above the fold grabs the target audience’s attention as soon as they land and encourages them to keep reading. But they don’t stop there. Since Chronotek is B2B software—and likely requires a significant investment of time and money—it’s essential their landing page paints a full picture. By listing six key ways customers benefit (e.g. simplified payroll, live reporting, in-app messaging), Chronotek outlines the value of investing IT dollars in their time-tracking software. An example of the copy paired with videos Chronotek uses throughout the page. Though many prospects might be convinced by the features and benefits of this product alone, using a long-form landing page lets Chronotek make a more emotional appeal to anyone who has remaining objections or needs to hear certain key phrases before they’ll sign up for a free trial. Why this works: Transparency and convenience builds trust. Again, not a ton of page sections length wise on this one, but this law firm’s page does contain a fair amount of copy. That said, it also doesn’t waste any of their visitors’ time. 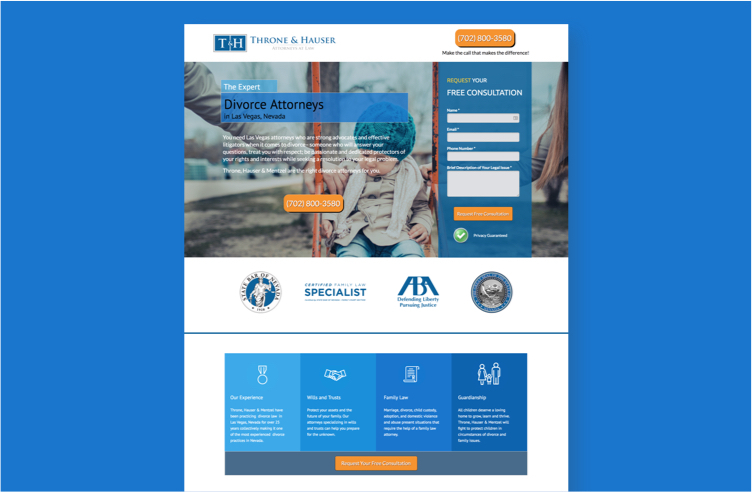 The company’s services and location appear immediately—plus a short description of why a client should work with Throne & Hauser. They also feature the credentials visitors expect from a reputable law firm upfront. And, finally, we see two simple methods of contacting the company (via phone or form). By including personal bios about the firm’s lawyers (photos included), the page creates a connection, which is critical in a largely relationship-driven industry. Testimonials further boost prospects’ trust in the firm by showcasing examples of happy clients. The hero shot features a sad child divided between parents, while the image underlying the call-to-action at the bottom shows a parent and child happily united. Using their page this way allows Throne & Hauser to tell a story and evoke emotions. Why this works: Credit where it’s due. 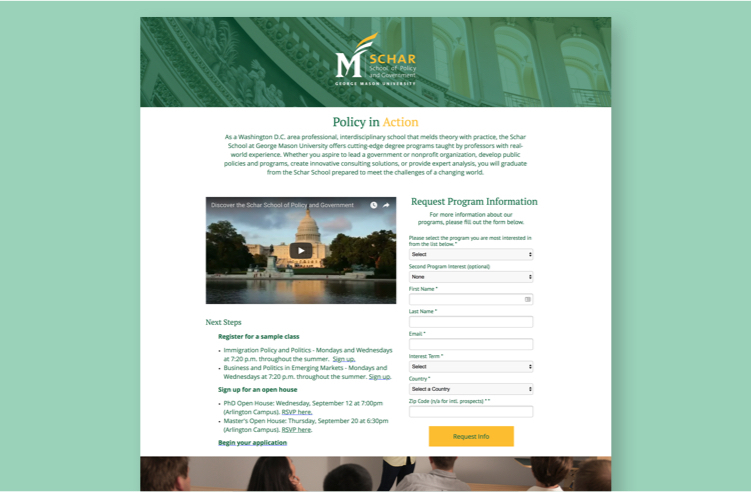 To impress prospective students, the Schar School at George Mason University has included tons of information on its long-form landing page. Readers quickly learn that the school operates in Washington, D.C. (location’s a major factor when it comes to selecting a university) and that programs combine technical skills and theory. If a student’s interested, they can easily request more information and start their application using the form. There are also opportunities to enroll in sample classes or attend an open house. The page also includes degree program descriptions. For these (lengthy!) blurbs, short-form pages wouldn’t cut it, but this is the kind of specific info prospective students need to determine if a given option is right for them. The page leads with the school’s Master’s programs, which makes up the bulk of its enrollment. And although it might make sense to create separate landing pages for each degree program, using a longer format for this landing page helps provide an overview for students who might be considering multiple programs. …across five industries no less! These companies all needed a few more words to get their point across, with detailed descriptions, testimonials, and achievements that short pages just don’t have room for. The extra copy helps the brands be empathetic to the often significant personal or financial impacts of the offers at hand. Ultimately, the nature of your industry and product or service will help dictate landing page length. What’s important to remember is that there’s no hard and fast rule. We’re often taught that shorter is sweeter, but landing pages—like naps, daylight hours, and vacations—can sometimes stand to last a little bit longer.